It used to be said, “If you can’t get the roof on by the first snowfall, wait until spring”, but not anymore. There are now many new products and technologies that allow builders to work all year long. New expanded lighting systems compensate for the shorter daylight hours. Portable heaters and lighter, warmer clothing allows builders to move easier in colder temperatures. But be prepared to get out your wallet. Staying warm can be expensive. 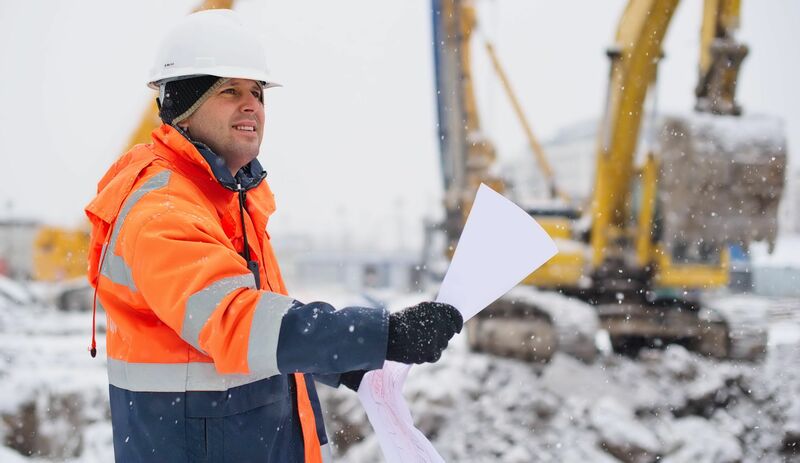 Snow Removal – Find a reputable company that will keep the construction job site and all accesses clear so your crew can keep going and your materials can be delivered. It may cost a few more dollars for reliability but you will be glad you did it. Be sure you build additional time for snowstorms into your time estimates. Heating Expenses – Temporary heaters are not only expensive to buy, but expensive to run. And you not only need to keep your crew warm, but some of the building materials also need more care. Shingles turn brittle and become hard to handle in the cold, plus they may not seal as well. Ground heaters and blankets may be necessary for concrete work. Lighting Expense – Shorter daylight hours either cut building time from the workday or require the expense of additional lighting. … be sure to build additional wintertime expenses and time into your bid. They can add up, dramatically biting into the profit margin. And you don’t want to have to go back to your client asking for more money to cover the added costs. For more tips to think about when building your construction bids, consider taking an online course on Construction Estimating and Bidding. The wintertime is also a great time to get your builders or contractors license continued education out of the way. There are bound to be a snow day or two throughout the season, so having online courses ready and waiting for those times when you need something to do is a prudent move. This entry was posted in Construction, Exam Prep.